Hayabusa's sampler is a device built to collect fragments of surface materials of an asteroid. A part of the sampler extends one meter underneath the spacecraft. 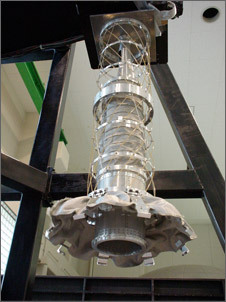 Known as the sampler horn, it's a cylindrical tube of 20 cm in inner diameter, which is connected to a con sticking out from the interior of the spacecraft. When the tip of the device touches the surface of the asteroid, it fires a bullet to fracture the surface. Gravity on the 500-meter asteroid Itokawa is less than 1/100,000th that of the Earth such that the fragments ejected up by the bullet ricochet up the sampler horn interior and are reached to the sample container inside the spacecraft. This is the world's first attempt at collecting samples from the surface of any celestial bodies beyond the Moon, and returning them to the Earth. Q. What was the greatest challenge in developing the sampler? It was a process of trial and error because nobody had ever built such a device before. We didn't know what Itokawa's surface would be like before the spacecraft actually arrived there. Indeed, the assignment given to us was quite broad. We were to build a device that, no matter what the surface was like, would grab samples, ranging from monolithic bedrocks to powdery regolith, in the brief instant of each of the spacecrfat's touchdowns. In the early stages of development, many scientists and engineers brought their ideas and discussed about the best solution. For example, one idea was to press a sticky plate, like a glue trap, onto the asteroid's surface hoping that materials would stick to it. Yet this would work only if the surface was guaranteed to be covered with fine regolith, while nothing would be collected if the spacecraft touched down on a large monolithic rock. Finally, from among about twenty different ideas, we chose a technique where firing a bullet would fracture surface rocks or eject up fine regolith. Because the sampler horn is attached to the edge of the spacecraft, if the horn were to contact the surface of the asteroid for too long, the spacecraft would start tumbling on its center of mass. In other words, if the spacecraft did not ascend right after the touchdown, it would lose its balance and fall on its rear. Thus samples would have to be collected in less than one second, by firing a bullet at a speed of 300 meters per second. Once we had decided to utilize a firing method, we tried a variety of shapes of horns and bullets, in order to maximize sample collection. We conducted microgravity experiments using a drop tower and a parabolic flight jet plane until we were satisfied with the sampler design. The middle part of the horn is accordion-shaped, composed of double-helical springs wrapped in special fabrics functioned as a “bullet-proof-vest”, which was also our original idea. The merit of the accordion shape is that the horn can be fold when the spacecraft is loaded on a rocket, and in addition, the tip of the horn can be pushed against the asteroid's surface even if the surface is rough or sloped. Each event, from Hayabusa's launch, arrival, and touchdowns on Itokawa, was memorable for me. 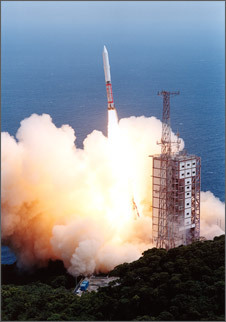 Hayabusa was launched by M-V rocket from the Uchinoura Space Center (USC) in May 2003. I was one of the staff members who had access to Hayabusa until the last moment on the launch day. I was in charge of removing the tube that supplied nitrogen gas to the inside of the spacecraft, and at last closing the small access lid of the rocket nose faring with the spacecraft stored in it. When I returned to the launch pad to clean the gas supply system after the launch, the rocket, which had taken off with Hayabusa on board a few hours before, was no longer there. Looking up the burnt launch pad, it finally sank into my heart that they had really gone into space. When Hayabusa arrived at Itokawa and I saw the asteroid, it instantly occurred to me that this was a celestial body that no human beings had ever seen before, and I got very excited. Contrary to predictions by many planetary researchers around the world, on Itokawa, there were very few clear, circular craters but many large boulders instead, like might be seen after a landslide on the Earth. I thought this might cause problems, because there appeared to be very few places for the spacecraft to land safely and collect samples. Subsequent observations revealed that a small plain, about 60 meters across, called the Muses-C Regio, was seemingly the only option for landing. 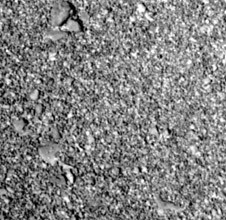 However, this terrain had neither monolithic bedrocks nor layers of powdery regolith as we had presumed during the development of the sampler; instead, it was covered with size-sorted gravel ranging from several millimeters to several centimeters in scale. We had never imagined that Itokawa would have such a Earth-like topography; so we hurried to perform additional impact experiments with gravel simulant targets. Since I operated Hayabusa during the day, I went to the laboratory every night after the operation and ran such impact experiments until midnight. Finally, the day of Hayabusa's first touchdown attempt arrived. I served as the operation supervisor of Hayabusa starting the moment after the event, and I was in the operation room with my colleagues, looking with bated breath at the data of Hayabusa descending to the asteroid. However, the data transmitted from the spacecraft was indicating that it was still descending, even after the estimated landing time. Because the spacecraft couldn't be sinking into Itokawa, we thought it might have missed the asteroid, or it might have already landed. I got worried. In the middle of the operation, there was no way for us to know what was going on with Hayabusa in outer space where it took more than 30 minutes for two-way signals traveling at the speed of light between Itokawa and the Earth. If the spacecraft had indeed landed, it might not be able to generate sufficient amount of electricity as the asteroid's rotation had placed it beyond the night terminator. On the contrary, if the spacecraft had come to rest in a spot where it couldn't continue communication with the Earth, it would also mean that we would lose the spacecraft. In either case, after a short but intensive discussion, we the operation team decided to send a command to the spacecraft for an emergency ascent in the direction of the Earth. It was a bit of a gamble, but fortunately, communication with the spacecraft was reestablished during my shift of operation, and we regained its control. The Hayabusa mission would have ended on that day had we not been able to regain control. I won't forget this invaluable experience for the rest of my life. Q. Do you think Hayabusa succeeded in collecting samples? Hayabusa succeeded two touchdowns on Itokawa. 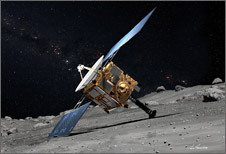 During the first one, subsequent analysis confirmed that Hayabusa successfully landed on the asteroid. 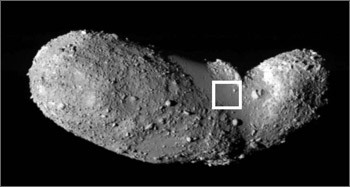 However, before the sampler horn was able to touch the surface of the asteroid, Hayabusa itself detected an obstacle during descent, recognized it as a danger, and decided to abort the touchdown. Since the command to cancel the touchdown also included a halt to the bullet firing, it was not conducted, as properly commanded. However, even after that, Hayabusa continued its descent by free fall toward the asteroid surface, instead of ascending away from it. As a result, the tip of the horn first touched the asteroid's surface, and the spacecraft came to rest there after bouncing twice, and ended up in that position for 30 minutes. For the second touchdown, the tip of the sampler horn was able to touch the asteroid's surface for about one second, followed by an immediate ascent. The attempt went as planned, thanks to the prior descent rehearsals. It was also confirmed that the landing signal, which is necessary for the bullet firing, was detected correctly. The only question now is whether the pyro was ignited when the bullet was to be fired. Confirmation of the pyro ignition was designed to be recorded in Hayabusa's temporary memory. Yet, when the spacecraft ascended from the surface to start transmitting signals to the Earth, we lost communication for a few days because it had fuel leak and lost its attitude control. Communication was recovered subsequently, but Hayabusa's computer was rebooted once while it was out of communication, and all the records temporality stored in its memory were cleared. By studying the circumstances with the information at hand, we've found that, unfortunately, there is a possibility that the bullet was not fired. If Hayabusa did not shoot a bullet during its second touchdown, I don't think that much of samples could have been collected because the contact duration with the surface lasted only a second or so, as designed. That said, even though a bullet was not fired during the first touchdown, Hayabusa sat with its sampler against the asteroid surface for 30 minutes, which was an unexpectedly long time. This gives us a reason to be hopeful. When the tip of the sampler horn, installed on the 500-kilogram spacecraft, poked the asteroid's surface at its descending speed of 10 centimeters per second, there is a chance that surface materials were slightly stirred and uplifted. Since Itokawa's gravity is less than 1/100,000 of Earth's, while Hayabusa was sitting still for 30 minutes, stirred-up gravel could have risen slowly up the horn and might have reached the sample container inside the spacecraft. Thus we are hoping that samples were collected during this first touchdown. The truth will be discovered when the sample return capsule is retrieved on Earth and the lid is opened. It would have to be the clash between the human imagination and the profundity of Mother Nature. It is difficult to grasp the mysteries and diversity of Nature based solely on the experience we humans have acquired through our short history. As the amazing features of Itokawa were revealed, I got a real sense that our imagination is limited by our experiences on the terrestrial environment. Itokawa shows us what conditions were like at the birth of the solar system; in a sense, it is like the ancient coelacanth fish. The coelacanth is still alive today, but by studying its body you can learn about the biology of pre-historic fish. It's the same with Itokawa; it's an existing celestial body, but it provides us with information about the time when the Earth was born, 4.5 billion years ago. I feel that I was given access to some secrets about the solar system, formation not through a story written with the aid of human logic or imagination, but directly from the Universe herself. Q. What does Hayabusa mean to you? Hayabusa was launched by M-V rocket on May 9, 2003. I don't have any children yet, but Hayabusa is like my own child. When it was launched, I thought Hayabusa would face more difficulties in space than it did during development on the ground. And I was right. Yet I have been working consistently with a firm belief that all the hardship will be blown away by great excitements when Hayabusa makes many discoveries at Itokawa, and returns with samples. I imagine that raising a child is probably more or less similar. A baby is born and goes through many things, including hard times and sadness, but I cannot imagine there is a parent who would wish a baby hadn't been born because of that. In the same way, knowing that Hayabusa was going through tough times, I sent it off into space hoping that it would be strong and overcome all challenges it must face. Having completed its mission at Itokawa, now we the operation team is trying to bring Hayabusa back to the Earth with samples. I feel now like a parent who is also experiencing growth through raising a child. With our experiences and lessons learned from the Hayabusa mission, I'd like to launch a series of new sample return missions from more primitive asteroids and comets. I'd like to collect precursor substances that will solve the mystery of the formation of life in our hands. It would be wonderful if it became possible to find the source of the ingredients for life on the Earth. I think there will be many discoveries to be made with the collected samples. In that sense, with Hayabusa heading back to the Earth now, it feels like we have just reached the halfway point of a marathon. A spacecraft like Hayabusa cannot be purchased in any stores. It's something to build with friends who have the same dream as you. In the business of space science, you have to make what you wish to accomplish by yourself. Hayabusa is neither animation, nor a science fiction movie, nor a TV game. I wish young generation to understand that Hayabusa is real-life, built by adults who devoted themselves to the space exploration. People of my generation were able to conduct the Hayabusa mission, so I think that children of the next generation will surely be able to do something greater than out time using their own brains and hands. I wish them good luck! Ph.D. in Space Sciences. Assistant Professor at the Department of Planetary Science the Institute of Space and Astronautical Science (ISAS)/JAXA. In 1995, Dr. Yano obtained his Ph.D. from the Unit for Space Sciences, Physics Laboratory, the University of Kent in the United Kingdom. Then after Dr. Yano worked as a JSPS postdoctoral fellow at ISAS and then an NRC research fellow at NASA Johnson Space Center, and he has been appointed to his current position since 1999. From 2003, he is also Assistant Professor of the Department of Space and Astronautical Science at the Graduate University for Advanced Studies. Dr. Yano specializes in planetary science and space environment science, and his research focuses on the solar system small bodies such as asteroids and comets, and meteors and cosmic dust as their fragments, as well as microgravity geology, hypervelocity impact physics and space debris. Since April 2007, he also serves at the Program Office and the Research and Development Office, JAXA Space Exploration Center (JSPEC).